Owen, a born talker, and arrives in Snow Valley during the first snow of the season. From this day on he has a special place in the Mayor’s heart as well as the Winter Festival show. While this chatter box may never stop talking, his heart never stops growing either. 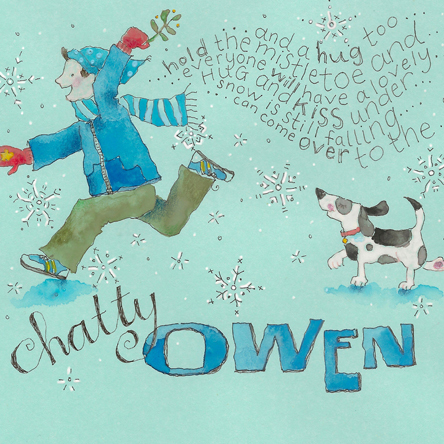 Owen is a little boy whose love for the town is as big as his vocabulary! Snow Valley is such a lovely little town. It’s beautiful at sunrise and delightful at sundown. In this charming little town is where our story commences. As it’s name might suggest, it snows here A LOT! How to use a snow shovel is one of the first things you’re taught. But when winter arrives here, it is extremely exciting. It was built many years ago by all the town’s people. Where the town holds auditions in Spring, Summer, and Fall. which is the highlight each year of the Winter Festival. The name of the annual show is announced by the Mayor. One year the first snowflakes fell much earlier than before. on the 26th of September near the steps of the Mayor’s door. At the hospital was born a little boy named Owen. Young Owen was expressing his own startling pronouncement. On the day he was born, he said, “Hi ma-ma, hi da-da”! About the young boy named Owen and the words that he said. But after chatting with Owen, he decided on “Miracles and Snow”. The Mayor played an angel and even wore a dress. But everyone will tell you that he stole the show. encouraging all those beneath him to “KISS KISS” and “HUG HUG”. who carried on talking even after the final curtain came down. You see when he started talking, he just kept on going. He talked and he chatted, and then he talked a bit more. As he grew older, the more he kept talking. He talked while he was sitting, or standing, or walking. He even talked while under water at the community swimming pool! The seeker never even had to sneak a small peak. He would always find Owen, as he could not stop talking. In winter, Owen always played a part in The Winter Festival. He was talked about the most after each annual show. But sometimes he had a tendency to speak everyone else’s lines too! For the most part the audience laughed whenever this occurred. But there were some folks in town who became more and more disturbed. They sent a letter to the Mayor, which he read word for word. It suggested that certain children should be seen and not heard. As the Mayor read the letter, he got the message loud and clear. They were talking about Owen, with a tone quite severe. The Mayor made his announcement with a wee tear in his eye. But sadly he added that there would be no auditions for one little boy. That the Winter Festival show this year will not include Owen. But it was really not that surprising to everyone Owen knew. He was friendly and gentle and so very kind. with Owen encouraging everyone to do their very best. the only thing larger that his vocabulary was the size of his heart. Then on the third day of the Festival came the annual show. as the audience took their seats on this magical night. He clapped with excitement and tapped with his feet. He asked everyone if they were comfortable and had a good view. The scene was amazing and Owen couldn’t believe his eyes. And suddenly from the audience came a few angry sighs. Quite a few others agreed, and the Mayor feared a riot. Owen was removed so that no one would be disturbed by his voice. to a room with two windows and a speaker on the wall. Owen was so full of kindness and enthusiastic joy. As for what would happen later, they did not foresee. Owen’s caring unselfishness gave his heart-strings a tug. The curtain rose with a WHOOSH for the show’s second half. It opened with a snowman enjoying a nice frozen bath. With Owen bothering no one, nothing could possibly go wrong. It had reached halfway up the Great Theatre’s main door. Even the skylight out front had been covered with snow. Owen caught a glimpse out of the room’s back window. And he could not tell anyone since the room’s door had been locked! And Owen’s door remained locked, no matter how hard he tried. The town of Snow Valley was becoming a valley of snow. Snow covered all the houses and their windows and doors. Until snow finally covered the steeple of the Clock Tower. Until the final curtain fell and it was time to go. They finally became aware of the enormous snowfall. Owen walked out to find the whole town rather shocked. Owen gathered his thoughts as he nudged his way through. And considering Owen’s chattiness, that seems quite absurd. Owen then did what he does best and spoke for a while. and told them a story about snow and the weather. He made them all laugh and sing playful songs. Soon all of the children felt that nothing was wrong. And reminded them all they were sisters and brothers. They hugged and they talked and they told family stories. The laughter amongst them washed away all their worries. And magically it was cutting through the snow like a knife. From the loving warmth of the banter that Owen was causing. He nudged close to the Mayor and held tight to his hand. The Mayor beamed with pride as he strode cross the floor. In fact, at this point nobody seemed to want to leave at all. and gathered all together with melting snow at their feet. Who stood rather proudly at the top of the stairs. Behind them he could now see the Clock Tower steeple. The town’s people were closer than ever after this entire ordeal. A small boy who was chatty, and loving, and clever. The Mayor broke tradition in front of one and all. Regarding the next Winter Festival’s show name. It shined like a beacon on the star of the night.